Cinderblocks 4: The Walking Gallery Gathers is an art and medical conference that will be held in Grantsville, MD at Penn Alps Restaurant and at Little Crossings by The Cornucopia Café May 18-20, 2017. I founded this event with the help of several other epatients and I am happy to see it enter its fourth year. 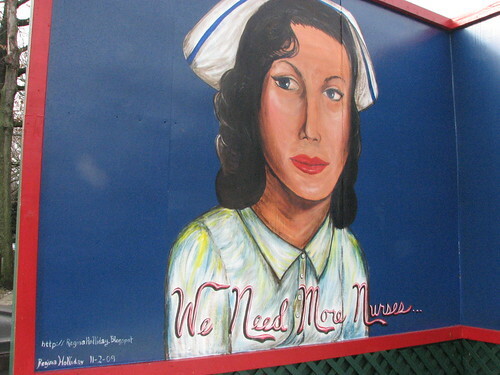 I am known in healthcare circles as the artist that founded The Walking Gallery. 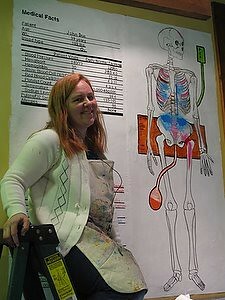 I and 46 other artists paint patients stories on the backs of jackets that people wear to medical conferences. I see #Cinderblocks4 a continuation of the message of The Walking Gallery and as venue that prizes the patient and provider in equal measure. We will use our days at this conference to focus on improving health care everywhere. Pechakucha is a fun & concise presentation style. PechaKucha nights have 8-12 speakers who follow a 20 slides 20 seconds pattern. We will have a few Cinderblocks attendees presenting! On Thursday, May 18 we will meet at 8:00 am at Penn Alps Restaurant and Meeting Center for breakfast in the Alpine Room. 8:00 Opening remarks are by Regina Holliday, conference planner and founder of the Walking Gallery of Healthcare. 8:05-8:25 Paul Edwards, County Commissioner for Garrett County will present on the state of the county and the history of Grantsville. Mr. Wilt holds a Bachelor’s degree in Political Science from Frostburg State University. He went on to do graduate work in Healthcare Corporate Compliance at George Washington University and then obtained a Master of Health Administration from Capella University. He joined Mountain Laurel Medical Center in 2010 and currently serves as the Chief Executive Officer. Prior to joining Mountain Laurel, Mr. Wilt worked in sales and marketing. Mr. Wilt helped evolve Mountain Laurel Medical Center through community-based advertising. In 2011, he constructed the first website dedicated to educating the public about Mountain Laurel’s mission to serve Garrett County and the surrounding areas. He also led the effort to achieve Patient Centered Medical Home Recognition from the National Committee for Quality Assurance (NCQA). Mr. Wilt serves as Chair to the Garrett County STEPS to Better Health Committee and he has served as Election Judge with the Garrett County Board of Elections for over 15 years. He is a lifetime resident of Garrett County and resides in Oakland. 10:05-10:55 Angela Radcliffe, FCBHealth, a workshop on clinical research as a care option where she teaches brainstorming techniques. At Ameriprise, our goal is to help clients achieve the full and rich life they have earned. With our exclusive Confident Retirement ® approach we look at four basic needs: covering essentials, ensuring lifestyle, preparing for the unexpected and leaving a legacy. Together we will explore each to create a comprehensive financial plan customized to your life. Then we’ll track your progress and make adjustments as life unfolds. I’m committed to your success and believe that when you take the right approach to financial planning, life can be brilliant. I began my career with WoodmenLife in 2016 as a Sales Representative. I’m proud to represent a not-for-profit organization with more than 125 years of financial strength. Our longtime commitment to our customers and to the communities we serve is what sets WoodmenLife apart. Uses patient-centered interdisciplinary approach to health care and care coordination, utilizing patient values and goals, community resources and benefits such as home based assessments, medication reviews, enhanced monitoring, and expert consult among others. Ranger Julia Musselwhite has worked for the Maryland Park Service since 2006, beginning as an AmeriCorps volunteer with the Maryland Conservation Corps and eventually earning full time ranger status. Her career began near her hometown in Harford County, but she has been a Garrett County resident since 2011 and is the current Assistant Park Manager at Rocky Gap State Park in Allegany County. Whether for work, or in her personal life, Julia enjoys time outdoors and helping others discover new opportunities and adventures. Lunch is at noon. Some attendees will go on a walking tour with Ranger Julia. 12:50-1:20 Mary Anne Sterling PCORI-funded project that speaks to many things the ePatient community holds dear. It’s called Patient Priorities Care and the goal is to align primary and specialty care to improve the health and healthcare of older adults with multiple and complex health needs. A pilot project is already rolling in Connecticut. 1:25-1:45 Heather Hanline, Executive Director of the Dove Center, will present on the correlation between health disparity and trauma/sexual violence. Hanline holds a Master’s degree in Counseling Psychology and is a Licensed Clinical Therapist. She has over 24 years of experience in the human services field, working with trauma victims in a variety of settings. For the past 19 years, she has followed her passion to end domestic violence and sexual assault with the Dove Center, where she began as a counselor and has spent the past 17 years as the Executive Director. She is a past recipient of the Governor’s Victim Assistance Award, for doubling the number of individuals served by the Dove Center in her first year of leadership. She also spearheaded the building of the Dove Center’s combined counseling and shelter offices, which now stands as a permanent symbol of safety and healing. She has written guest blogs for several statewide organizations, and has originated many innovative programs within the Dove Center’s programming. Joleen Chambers (Dallas, TX) is a trained FDA Patient Representative (with an M.S. in Rehabilitation Counseling) and a national advocate (member of Consumers Union Safe Patient Project, National Patient Advocacy Network, board member of HealthwatchUSA) for patients preventably harmed by unsafe and ineffective implanted medical devices. At home in Dallas, TX Joleen is a board member for Leadership Women, Dallas Black Dance Theatre and Undermain Theatre . Her brother, Steven Baker, is a career union millwright. In 2001, a criminal harmed him on-the-job and his elbow received multiple fractures. In 2008 he was referred to a respected national health institution for an ‘innovative’ new elbow replacement implanted by the surgeon that designed the device. Just 4 months later, the device was unsuccessfully ‘revised’ by surgically removing two of the 4 components. Steven now lives in rural southeastern Minnesota on the generational family farm while enduring unrelenting pain and loss of function in the elbow. 3:30-5:00 Donna Jo Brenneman, Executive Director of Garrett County Hospice Screening ”Being Mortal” by Atul Gawande. The daily educational conference session ends. Feel free to explore the grounds, rest and grab a bite to eat before the evening program begins. On Thursday, May 18th at 6:00pm a dedication will be held at Salt and Pepper Studios: the home of the Walking Gallery 189 Main Street in Grantsville. Conference attendees and members of the public are invited. Refreshments will be provided and the dedication is free and open to the public. Joseph Kim of Eli Lilly will sing a few songs in memory of Jerry Matczak. Marsha Goodman-Wood will sing in memory of Jess Jacobs and Dave Wilt. On Friday, May 20th another conference day begins! At 8:00 am we meet at Penn Alps Restaurant and Meeting Center for breakfast and our general session. 8:35-9:00 Renee Green, presenting on her film project the documentary Buzz One Four Impact Documentary - Rescue & Recovery: About how the Grantsville Community became the first responders when a B52 with 2 thermonuclear bombs crashed on the mountain in 1964 during the blizzard of the century. 10:00-12:00 Local photographer Kristina Butler will take photos of the attendees in the lovely Casselman Bridge State Park. Stephanie Diane will be the stylist working with attendees during the photo shoot. 10:05-10:40 Mark Scrimshire from Center for Medicaid and Medicare Services in Baltimore will present a discussion on patient empowerment and Blue Button. 11:05-12:00 Mark Boucot, President and CEO of Garrett Regional Medical Center, an affiliate of WVU, will present on the hospital’s expansion in the last year and its continued embrace of value based care and the hospital’s plan to embrace cancer care in Western MD. 12:00-12:45 Lunch and field trip. Some attendees will tour the new cheese factory during lunch. Esther Fischer grew up in Sapulpa, OK and graduated from Oklahoma State University with a BA in Sociology, emphasis in Social Work. She began her career with the Oklahoma Department of Human Services in March 1997. For the past nine years, she has worked in Adult Protective Services, investigating allegations of abuse, neglect and exploitation of vulnerable adults. She has been married to Kelly for 17 years and is the mother to Kellyn, age 12. She enjoys being an adult leader in her son’s Boy Scout Troop, actively participates in her church in children’s ministries and choir, helps care for her aging mother, and focuses on her health by being a member of a Crossfit group. 1:45-2:00 Matthew Listiak, Los Angeles, CA, "Patient Stories, Patient Partners, Patient Solutions." Matthew Listiak is a filmmaker, bootstrapper, and web developer. He has worked in healthcare and patient advocacy for the past 15 years with the goals of reducing healthcare harm and giving a voice to patients through storytelling, websites, and e-learning. As producer of the Discovery Channel documentaries Chasing Zero: Winning the War on Healthcare Harm and Surfing the Healthcare Tsunami: Bring Your Best Board, he travelled the world capturing compelling stories and developing them into acclaimed television shows that have inspired positive change in the healthcare industry. He is a humbled and proud member of The Walking Gallery of Healthcare. He is currently developing a storytelling content engine and educational platform called Patient Solutions that will promote actionable, measurable solutions that are developed by patients, for patients. When he’s not filming, editing, or otherwise clicking and dragging, he enjoys growing food, taking walks, and watching Doctor Who with his daughter. In 2011, after her experience as a patient’s companion, Mélanie Péron, founded l’Effet Papillon, a social enterprise the aim of which is to create a real social impact on the lives of patients suffering from cancer, of vulnerable or isolated people and those who accompany them. Since 2011 the social company has accompanied almost 3,000 patients and today, l’Effet Papillon is a significant partner of the health community by offering a wellness overall approach to vulnerable and ill people. Jessica Gada, LCPC, LCPAT, ATR-BC is a Licensed Clinical Professional Counselor, Board Certified/Licensed Clinical Professional Art Therapist, and Energy/Wellness Coach in private practice in Bethesda, Maryland. Jessica was trained in art therapy and professional counseling at George Washington University where she focused on trauma-informed care through coursework, research, and internships at Children's National Medical Center and Walter Reed National Military Medical Center. Since then, she has worked in the public sector in domestic abuse and military behavioral health. Prior to her work as a psychotherapist, Jessica was a licensed Art Educator for grades K-12, when she first learned about the healing powers of art. Jessica has since crafted a unique service for DC area professionals and military service members/veterans who wish to engage in art therapy, mind-body work, EMDR, and psycho-spiritual healing through creativity and connection. 3:15-3:30 Kelly Lawman: Open Notes update. Lisa Skipper – Certified Navigator with MD Health Connection and Project Coordinator with RAEN (Rural Action Enrollment Network) at Mountain Laurel Medical Center in Oakland, MD since 2013. 5:00 is the close of the educational conference sessions. 6:15-7:30 Terah Crawford, The Terah Crawford Band is based in Deep Creek Lake Maryland. Combining their love for mountain music with classic rock, outlaw country and just a touch a folk, they’ve created their own style of playing. Check them out all over Garrett County, MD and surrounding areas to enjoy their homegrown Appalachian Folk Rock ways. 7:30-8:15 Ross Martin, MD will sing several of his songs focused on healthcare. 8:15-9:15 Marsh Goodman-Wood will sing in honor of those we lost . 9:15 the final performers will be fire dancers Christopher Closson and physical therapist and fire dancer Aaron Smith. May 20, 8:00 am meet at Penn Alps Restaurant and Meeting Center for breakfast and our general session. This day we will break into small groups to work on mentoring and individual coaching sessions. General Conference close at noon. Little Crossings will also host juried artists and local food venders for an Artisan and Epicurean Faire on this day.